SAN DIEGO – Downed trees were an issue in San Diego overnight Thursday, causing problems for drivers and damaging parked vehicles. 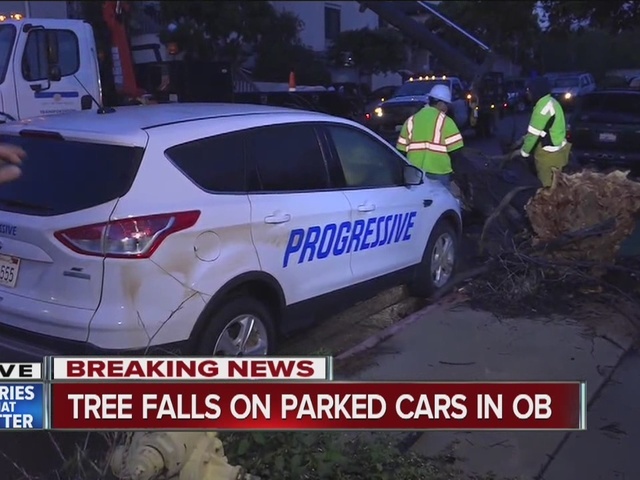 Sometime before 5:30 a.m. Friday, a large tree came crashing down onto a Progressive insurance claims vehicle parked in the 2200 block of Worden Street in Ocean Beach. There were no injuries. Earlier Friday morning, another large tree came crashing down onto Jamacha Road, just south of East Washington Avenue. Arched branches were dangling over the road, with the tree blocking the southbound lanes of Jamacha. Some cars decided to drive under the branches, while others weren’t so successful. I was unable to see it from like five, six feet away. It was really dark here,” said Afram Basheer, who hit the tree. It left a large dent in his hood and shattered his windshield. Basheer told 10News he wasn’t hurt. Police closed down part of the road until crews chopped the tree up and moved the logs to the side.